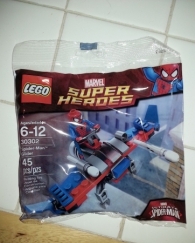 You are looking at Lego Superheroes polybag 30302 Spiderman Glider. This set is brand new in factory sealed package. Great addition to your Lego Superheroes collection. PAYMENT: Immediate payment is requested. Only Paypal is accepted for payment. SHIPPING: Domestic and International shipping are available. Most items are shipped USPS.